The relationship between man and God forms the focus of most religious literature. Of paramount importance to the relationship is the conduct, behaviour and action of man during his sojourn on earth. What he says and does is deemed to affect that relationship: good deeds strengthen it, bad deeds impair it. It is thus considered crucial that man be made aware of what he may and may not do, that he be made to understand the limitations of his actions beyond which he may not transgress without placing in jeopardy the health of that relationship. Such awareness is made explicit not only in scriptures and holy texts but also in books, epistles, treatises and poems composed by men of faith and learning. The Kalam-i Mawla falls under the latter category. The Kalam-i Mawla (hence referred to as Kalam) is a poem of 327 verses, composed in Hindi, whose content draws inspiration from the sayings, speeches and sermons of Mawlana Ali(a.s.). The actual composer of the verse is not known. Unlike the practice followed in some compositions, – for example, in the Ginans – where the composer mentions his name within the body of the text, the composer of Kalam has refrained from doing so. His action may have been dictated by modesty, or even piety, in not wishing his personal attribution to impinge upon the considered authorship of the first Imam. Thus the authoritative status of the verses, as expressing the Kalami (speech/sayings) of the Lord, Mawla, has been preserved. Pages from a Kalam-i Mawla manuscript in the collection of the Institute of Ismaili Studies, London (MS KH21, pp. 30-31). Copied in Samvat 1880/1823 CE by Saju Pajuani in Surat, Gujarat. This text is entitled “Kalama: Hajarate: Shaha: Mowla: Muretaja: Aliajo:”.Versions are arranged differently; for example, this 1823 CE manuscript version has no chapters. 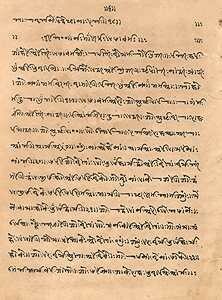 While the later 1905 CE printed Devraj edition begins with verse 2, this 1823 CE version begins with verse 1. Translation of this first verse is as follows: "Listen, o brother believers, to the account of the teaching of Mawla ‘Ali), who has said that you should recognise a man’s faith by his word, for he who is truthful in word has a true faith. One’s word is the token of the truth of one’s faith". The predominant message conveyed in Kalam is ethical. One could say that the text is a manual of ethics for a believer, stating the virtues to be cultivated and the vices to be shunned. The ethical emphasis is brought into an even sharper focus in the printed editions of Kalam-i Mawla. A comparison, for instance, between the earlier manuscript of the Kalam dated 1801, and the latest printed version published in Karachi in 1984 (by Ismailia Association for Pakistan – this institution is now known as The Shia Imami Ismaili Tariqah and Religious Education Board) shows a re-arrangement of the verses in the latter to reflect an ethical direction of the message. The Karachi edition, which is itself the latest in a long chain of printed versions dating from 1873, divides the text into 23 chapters, each with its own title. The first chapter is on truth, the second on brotherhood, the third on the virtues of good manners or discipline, the fourth on generosity, the fifth on miserliness, the sixth on greed and so on. Among the subjects included are the way of the heart (ch.7); the beauty and marvel of knowledge (ch.10); the path of injustice (ch.11) and of justice (ch.12); prayers (ch.14) patience and gratitude (ch.16); jealousy (ch. 22) and courage (ch.23). The Kalam-i Mawla, however, does not confine itself simply to conveying the ethical message. If it did, it would have been incomplete in a fundamental way for ethical injunctions derive their meaning from the assumptions and pre-suppositions of belief. To state what man ought to do and not do, without placing these imperatives within the parameters of belief would be to deprive them of their rationale and justification. They would lack conviction. The composer of the Kalam has avoided such a pitfall and has created a vibrant text by focusing, not on one, but on three interlinked dimensions, each supporting the others. These dimensions are (1) the Doctrinal (2) the Esoteric and (3) the Ethical. The second dimension in Kalam-i Mawla is the esoteric. One finds verses of deep mystical meaning in the poem which encourage the reader to aspire to a higher spiritual reality. The emphasis is again on action: through prayer, bandagi and acquisition of knowledge. Prayers undertaken at (or after) midnight are given a special mention (verse 168) as they bring ‘light’ to the very being of a person, a light reflected on one’s face; then, on the Day of Judgement, one will be counted among those whose faces are white (of. Qur’an 3:105-106). A believer who is regular in his prayers and bandagi will be graced with the vision of his Lord (verse 170). If such a mu’min is a true beloved of the Lord, then he too will be granted the spiritual bliss of the mi’raj experienced by the Prophet (verses 170/171). But a believer who wishes to attain such spiritual bliss must first have a guide, a murshid, to open the gates of esoteric knowledge for him. Even a tiny and minute amount of such knowledge – “mere dot (nukta) of marifah” as it is stated in verse 101 – is enough, if given by the murshid himself, to lead a mu’min back to his origin, to the essence of Truth (haqq). Only then will he be able to transcend the state of duality (“The duality of You and me” and merge into a state of Unity and become One with Him who is the First and the Last, the Manifest and the Hidden, He who will continue to exist when all else perishes (verse 327). The (ethical) injunctions themselves vary in content and even in the style in which they are expressed. In terms of content, almost every major aspect of a Muslim’s way of life has been covered. The headings of some of the chapters cited in the previous reading, give an indication of the variety of the themes: the sub-themes are even more pervasive. Let us take chapter four as an example and consider its contents which deal with the theme of charity and generosity (sakhawat). While each of its seventeen verses is pertinent to that theme, its exposition relates to different aspects of the subject. Man is placed – as indeed he must – at the centre of the injunctions. But around him are constructed premises or arguments to help him see the benefits of being generous, benefits to be gained both in this world and the next, benefits both material and spiritual. Thus, generosity expressed also as acts of charity and philanthropy, is made a cornerstone of the relationship not only between man and God but also between man and man The two are interlinked, the one expressed in terms of the other, as we shall see below. In so doing, the verses (18 to 34) also address themselves to fundamental questions of the theme: what is charity; to whom should one be charitable; in what way; and, perhaps most important, why. Since God has given wealth to a person through His bounty, His barakah, one should not hide or gourd that wealth but spend from it ‘in the way of God’; for, vast amounts of wealth which are either concealed from others or spent entirely on oneself eventually turn to dust and do not benefit other human beings. If, on the other hand, one gives generously in charity or is philanthropic in action, one is rewarded both in this world and the next. The act of giving is compared to ‘the philosopher’s stone’ (paras): just as the latter turns to gold what is rubbed against it, so does the generous character of a person bring him the good things of life. People come to respect and love such a person and accord him a high position in this world and offer prayers for his well-being. And God – as the Razzaq, the Provider – grants him prosperity in wealth, family, household and rank in society. A philanthropist is the beloved (habib) of God who will grant him a rank close to Himself in the abode of the Hereafter and whose name will not perish in this world. How should one give? A short answer from the verses is that charity ought to be given with a smile, with a feeling of happiness. The aim is to make the recipient happy. It is stated repeatedly in these verses that a donor must not make the recipient feel obligated to the giver nor should he hurt his feelings in any way. If these injunctions are violated, his charity will be considered “lost”, that is nullified in the eyes of God. Such a way of giving requires a disciplined heart, a heart that is under control from pride and arrogance. Feelings of kindness in the heart of the donor are gradually accompanied by respect and love for the recipients. And who are the recipients? Although the verses do not give details of their identity, two broad categories are mentioned: the orphans and the weak who should be approached ‘by the strong’ with a view to aiding them in whatever ails them. The onus of taking the initiative is placed on the srong. It is interesting to note that charity is conceived, not only in terms of the giving of material wealth to those who are poor, but also in helping to redress the wrongs committed against the weak, to bring justice to those whose rights have been infringed. Verse 28 states pithily: “The weapon of the weak is to grieve, and to shout out laments to all” but, it goes on to ask: if the grieving do not possess the wealth or the strength to defend themselves, and they continue to be oppressed with suffering and pain, what can be done about it? The implication is clear: the weak need those with a sense of fair play to stand up for them. That too, would be an act of charity. The second feature employs the conditional as a literary device in the construction of a moral premise along the lines “if this…..then this ……” or “if this..then do this ……”. Some examples on different topics are given below. The third stylistic feature employed in the Kalam is a common literary tool of using particular images to convey certain meanings and messages. The images themselves may be ordinary ones drawn from nature and daily human activities, or else special ones located in the poet’s culture. The examples given below, as indeed those cited above, represent but a small portion of the spectrum available in the Kalam-i Mawla. Examples of ‘cultural’ images need an explanation. The first is drawn from 4:32 where we are advised to partake of our food with others. The way the meal is served forms the theme for the poet’s injunction in this verse, for he sees people sitting around a single large plate or vessel and eating together from it, as was – and in parts still is – the custom in the East. The custom, we are told, has two benefits. People eating together are blessed with the bounty of God, barakah and, secondly, the food itself can be made to be sufficient for an additional person; for example, four people could eat with satisfaction the food meant for three. A translation is generally but a poor substitute for the original. That would certainly be the case in the rendition of 12:129 given above, particularly as, on its own, it does not reflect the tight metrical borders and the rhyme scheme within which the poet functions in the original language. And yet – however defective the transfer of the linguistic medium – the poet’s skill of combining different idioms is self-evident. Three sets of ideas are employed: the notions of right and wrong, of light and darkness, and of the gradual loss of faith. The paradigms drawn from the notions are arranged symmetrically: indulgence in that which is prohibited leads to darkness in the heart which, in turn, leads to a loss of faith (Iman): conversely, deeds undertaken within the boundaries of what is permitted lead to enlightenment in the heart and security of faith. The paradigms are expressed in the cultural images familiar to the audience of the poet. The body as a temple is one example. Just as a lamp (diwo) is an important ingredient in the temple, investing it with a symbolic (and functional) light, so does the heart perform that function symbolically in the body. But the lamp is not safe. It is threatened by the actions of the person himself: the more he flouts the ethical injunctions taught to him, the dimmer becomes the light in his heart This vulnerability is expressed in the metaphor of the body as a village where darkness enables five thieves to combine in a stealthy incursion to steal its valuables, the most worthy of which is faith (Iman).The five ‘thieves’ are mentioned elsewhere – that is in the ginans – as personifying five vices, panj bhu: of lust (kam); anger (krodh); greed (labh); temptation or single minded attachment to the material aspects of the world (moh) and pride (madh). The ethical dimension in the Kalam-i Mawla is expressed at three interlinked levels. The first level situates the ethics of the faith within the doctrines and beliefs of Shi’a Islam. These form the foundation upon which the ethics are based, an embodiment of the ‘charter’ that provides the rationale for the ethical development of a Shi’a Muslim. And, perhaps more important, the beliefs and doctrines also reveal – indeed, proclaim – the sanctions that await the transgression of the enunciated ethical injunctions and the reward for their observance. The second level involves the pronouncement of the moral injunctions themselves. In a work of prose, the pronouncement could perhaps be made at length, with explanatory notes and cross-references to weightier texts, including the Quran itself. In poetry, however, an exposition of the theme is governed by such literary constraints as the rhyming scheme and control of the required number of metres per line. The poet has thus to be economical with his choice of words which in turn, ‘forces’ him to make a selection of the themes of priority. What we thus have in the Kalam-i Mawla is the poet’s own choice of what he considers to be important injunctions to be conveyed to a Muslim. The third level is the literary. We have referred above to the constraint – and challenge – imposed on the poet by the prosodic tradition and convention prevalent in his culture. The poet functions within the prosodic framework to convey his message and ideas. But the framework, at best, is no more than a skeleton in need of flesh and blood to give it form and meaning. And the poet provides this drawing on the idioms of his culture, society and everyday expressions of daily living. The choice of vocabulary, images and metaphors combined with the poet’s own skill of wielding them into verses meant to be read and intoned make the Kalam-i Mawla a truly enjoyable poem to be read for pleasure, instruction and inspiration. The presentation given in these readings, in relation to the ethical injunctions in the poem, represents but a tiny sample of a vast corpus. END. I am grateful to Mr Akbar Rupani of the Tariqah Board for India, to Mr Hoosain Khan Mohamed, formerly of Karachi, and to a gentleman who wishes to remain anonymous, for their kindness in checking the translation of the Kalam-i Mawla that I had undertaken a few years ago. Their help, given with unstinted generosity, was most encouraging; but may I also state that it does not associate them in any way with any errors of translation that may arise out of my choice of meaning. I am also grateful to Mrs. Izzat Muneyb for her comments on an earlier draft of this article. Adapted from Ethics in the Kalam-i Mawla: A Brief Introduction, by Dr. Farouk M. Topan, published in Ilm, Vol 13, Number 1 (July 1990), Shia Imami Ismaili Tariqah and Religious Education Board for the United Kingdom. Please note that images accompanying this reading are not part part of the original article. Thank you Dr. Farouk Topan for analyzing and defining Kalam-e-Mawla. Whenever possible I listen to Kalam-e-Mawala, sometimes as many times a day back and forth to work as I carry a cd in my car, desperately wanting to understand the message and the guidance it is delivering. After reading your paper the message has become more clear. May I know what the original language of Kalame Mowla is. I am truly humbled by the depth of knowledge in this article and of the logicality of its presentation. It has inspired me to search deeper within myself to become a better human being. Truly touched by this analysis of Kalam-i-Mowla of Hazrat Ali by Farouk Topan. With my special interest in Hazrat Imam Ali as our first Imam, the gate of Islam who carried it forward where the great Prophet left off, with my study in Social Anthropology and writing of original thesis on Social Changes in the Ismaili Society covering the four Aga Khans and interest in mysticism, I become inspired when I visit London and get to listen to the Kalam. Thank you for this article.